Created by the Dorset Coast Forum and by web developers One Bright Space as part of the C-SCOPE project, iCoast puts a range of information about water sports and coastal activities instantly at your fingertips. A unique feature of the site is access to real-time weather, tidal and current information and sea conditions. Whether you are a kayaker, sailor, surfer, climber, sea angler, scuba diver or walker, iCoast is an invaluable tool for planning and maximising your enjoyment of these and many other activities. The Revised Shoreline Management Plan between Hurst Spit and Durlston Head provides a long-term vision for the management of the coastal defences over the next 100 years. The full SMP and supporting information is now available to download from the project website at http://www.twobays.net/ and to view at local council offices. A SMP summary leaflet is also available for downloading from this website. People of Purbeck may be interested to know that there is to be a petition (38 Degrees ) being presented to Richard Drax MP for Dorset South. The petition is opposing the government's NHS reforms and is part of a national campaign to save the NHS. Colliers Lane runs between the A352 and Wool High Street. Suggest meeting in The Black Bear Inn (on High Street BH20 6BP) before the meeting, say 1.45-2.00pm. Well, well. The folk up the hill at the muni park have been sent a letter from the new park owners. 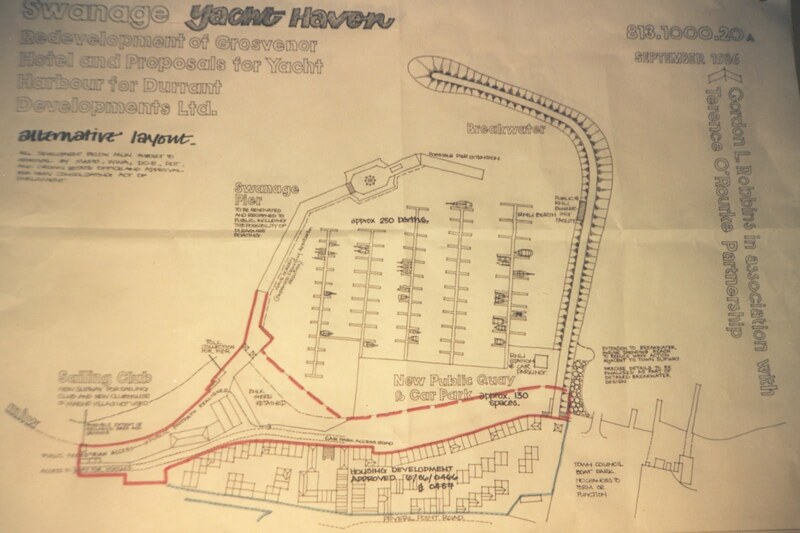 It sez that after lenthy delays and legal consoltations with Swanage Town Council it will give the people up there a bit of a break fee wise. So, how much money did STC have to refund to the new owner (Derwin) to compesate for the lower fees for the owenrs? 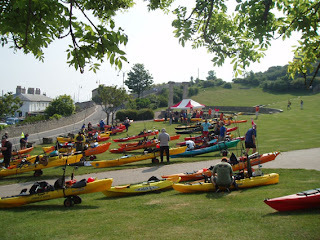 There’s a great chance to try kayaking for free at this year’s OK Classic Fishing Tournament in Swanage. While the tournament competitors are out on the water, a special demonstration day will be taking place where colourful recreational sit-on-tops will be on display and members of the public will also be able to get afloat and have a go. Last year the colourful event attracted huge interest. Sit-on-top kayaks are very stable, offer fantastic value for money and the self-draining, open cockpit design makes them very safe. London-based property developer Welfare Dwellings Residential Care Ltd says it will hand over the building if district planners allow construction of up to 50 homes on site. Swanage Blues has been nominated for Best British Blues Festival! up against some huge festivals so please follow the link and cast your vote! Thank you! The first ever OK Classic Fishing Tournament which was held last year was a highly successful and enjoyable event raising £500 for the RNLI. Well this year, as Ocean Kayak celebrates its 40th birthday, it plans to be even bigger and better with the main prizes alone worth nearly £2,000. 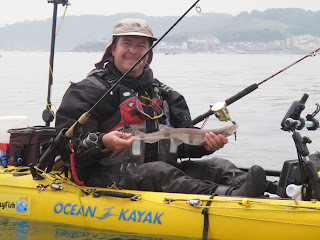 There are three fantastic fishing kayaks to be won; the first prize is a Prowler Trident 13 Angler, second prize is a Prowler Trident 11 Angler and third prize is a Caper Angler. In addition to a winner’s shield and winners’ medals, there will also be other ‘special’ prizes and fun awards on the day. 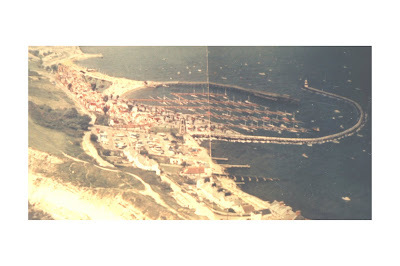 The tournament, which is sponsored by Johnson Outdoors UK and supported by AnglersAfloat, once again takes place on the beautiful waters of Swanage Bay, Dorset. The competition is open to all amateur kayak fishermen who would like to take part. This is a catch and release competition with competitors trying to catch as many different species as possible during an allotted time period on the day of the tournament. Last year 43 competitors took to the water and a total of 17 different fish species were caught. It costs £10 to enter the competition and all entry fees will be donated to the local Swanage RNLI Lifeboat Station. All competition entrants must be 18 or over and full entry details and the rules are available from the Johnson Outdoors UK website where entrants can also download the necessary competition forms. Purbeck Art Weeks Festival starts on 20th May and runs to 5th June. Purbeck Art Weeks Festival showcases the work of local artists through open studios and exhibitions of visual arts, combined with performance, music, film and lectures. Plenty more on the website. Looks like the Town Council have relaunched their website. It's been a while but at least it's up there and there does seem to be a massive amount of information! Compared to the last site!! Over 120 children from Swanage schools on the Jurassic Coast have been extremely busy! 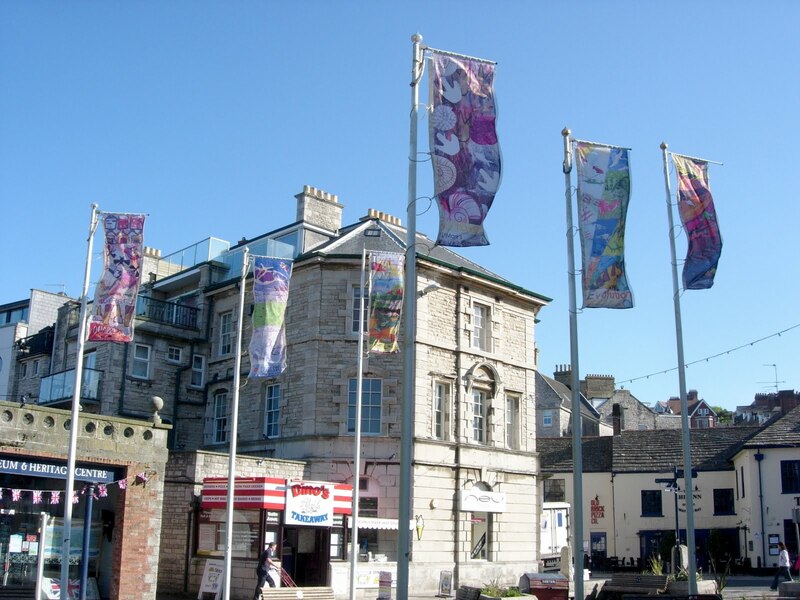 Taking part in an innovative creative project called STONY BONES, they have designed a series of new banners which have just gone up in the Square in Swanage, Dorset. This colourful addition to the town is the culmination of a programme of educational and artistic activities inspired by England's only natural World Heritage Site - visits, a boat trip and several creative workshops working alongside local artists Antonia Phillips and Annie Campbell. "Only tourism can save our bankrupt land" I read in the weekend press, the Greek Prime Minister has told his people. If the peripheries of Europe have worked this out why haven't we? 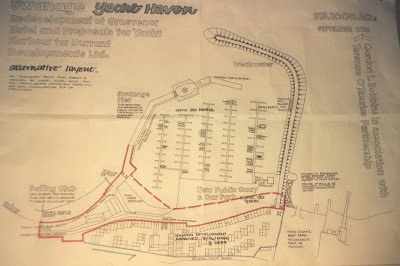 I was lent some old photos of the marina plans which made me think isn't about time this idea was rekindled? 250 safe berths and 130 car spaces with a cafe culture were proposed. Surely this would stimulate our local economy? Taken from the Surfers Against Sewage website. Did not know Wessex water were part of this campaign. SAS TO LAUNCH REVOLUTIONARY NEW SEWAGE ALERTS. At the start of the bathing season, May the 15th, we’re proud to be launching a new real time sewage warning system that will tell you exactly when sewage is being discharged into the sea at key locations around the UK. We have developed an online map that will automatically update you in real-time with information on combined sewer overflow (CSO) spills at surf spots. You’ll even be able to sign up for free text messages alerting you to sewage spills at some of our nation’s best beaches. This will give you the real-time water quality information to help protect yourself, your family and friends from any potential health risks associated with exposure to raw sewage. SAS has been exposing sewers discharging raw sewage onto the UK’s coastline for years. In recent times, SAS has elevated this issue to the front pages of national newspapers, onto prime time national current affairs TV programmes and highlighted it to Government ministers. True to SAS’s campaign ethos, we’ve always highlighted the problem whilst consistently promoting the solutions. The real-time CSO warning system is just that, part of the solution, giving you reasonable and adequate information, allowing you to make a more informed decision to avoid any short-term pollution incidents arising from the CSO’s that impact on your favourite beaches, bathing waters or surf spots. Local elections are being held on Thursday 5th May to elect Swanage representatives for Purbeck District Council and Swanage Town Council. There will also be a referendum on whether to adopt the Alternative Vote, rather than the present 'first past the post' system, for national elections in the future. You should have received a Polling Card with details of where to vote, but you don't have to take your card with you to vote. Please vote (or promise you won't complain about anything to do with any councils for the next four years). Sally Maltby says: "There has been much criticism of the way the Mowlem Institute in Swanage has been run for several years. On advice, it seems that the way forward with the Mowlem is that we get a deluge of new Friends and then call an Extraordinary General Meeting and voice general disquiet and work out with them how things can improve. If you are interested in improving the Mowlem please become a Friend as soon as you can - and encourage anyone else - hopefully this week and then we can at least ask the secretary to call a meeting at the beginning of May".